Wireless Video Where You Need It! The convergence of video surveillance and IP networking technology has lead to the prevalent use of computer based video and access control security systems operating on IP network infrastructure. 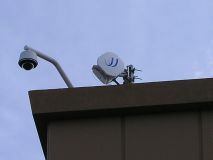 Wireless backhaul, also known as fixed Ethernet wireless bridge, networks significantly reduce the cost of this infrastructure by either eliminating the need for structured cabling or augment structured cabled cctv networks by expanding the reach of the network parameter that cannot be reached easily by structured cabling. 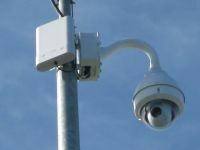 Organizations of all verticals, from retail, education, to government organizations are being challenged to install outdoor video surveillance in areas that are too remote, too costly or physically impossible to reach with traditional cabling or fiber (wireless last mile applications). 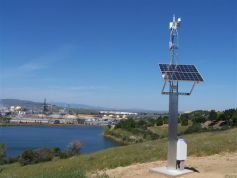 Outdoor wireless bridge backhaul of video surveillance and security solutions allow for the wireless backhaul of high-resolution, real-time video surveillance from an unlimited number of video surveillance cameras and control systems. Wireless backhaul solutions can be deployed quickly and cost-effective. Video (cctv or IP) cameras, along with other security monitoring systems, can be transferred over point-to-point wireless, point-to-multipoint wireless, or wireless mesh backhaul systems. Wireless video surveillance solutions can be used in permanent fixed wireless backhaul, a temporary wireless video system, or mobile applications with wireless mesh. Because wireless backhaul allows for quicker and more affordable deployments, organizations can scale their coverage needs and relocate systems as needs change. Even over vast distances an organization can deploy wireless video surveillance equipment.